Leverage in Financial Management can be defined as deciding the proper mix between the fixed cost and variable cost. 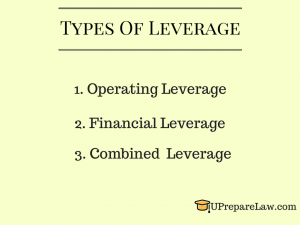 Leverage is a practice that can help a firm to drive up it’s gains or losses. Basically, Leverage in Financial Management is the relationship between two interrelated variables. These variables may be cost, output, sales, revenue, EBIT, or EPS ( Earning per share ), etc. Therefore, Leverage may be defined as the percentage change in one variable divided by the percentage change in some other variable. 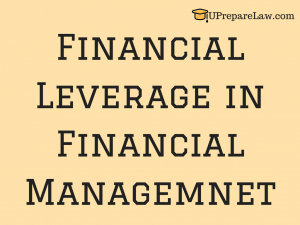 In other words, Leverage in financial management refers to the profit or loss arises to the organisation because of the involvement of fixed cost. For more Useful notes and important updates, Like our FACEBOOK PAGE and keep yourself updated with UPrepareLaw. Operating Leverage studies the impact of operating fixed cost. 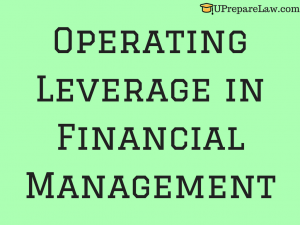 The operating leverage in financial management is the profit or loss arises due to the involvement of operating fixed cost. Therefore, operating leverage measures the relationship between the sales revenue and EBIT ( Earnings Before Interest & Tax ) or in other words, Operating leverage measures the effect of change in sales revenue on the level of EBIT. Operating Leverage may also be defined as firm’s position or ability to magnify the effect of change in sales over the level of EBIT. Financial Leverage studies the impact of financial cost, i.e., interest. It measures the relationship between EBT and EBIT. 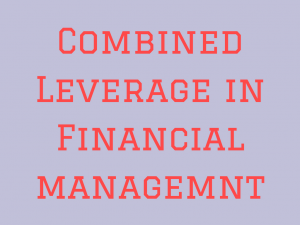 Financial Leverage in financial management arises due to the involvement of financial fixed cost. Financial leverage may also be defined as percentage change in EPS associated with a given percentage change in the level of EBIT. Financial Leverage helps to access the financial risks. Financial risk of not being to pay the financial obligations by the firm to the debt holders. It also helps in attaining trading on equity. The trading on equity exists only when the return on the investment is greater than the cost of the debt. Composite leverage arises due to the involvement of both kind of fixed cost ( i.e, Operating fixed cost and Financial fixed cost ). It shows the relationship between EBT and Sales. Combined or composite Leverage studies the combined effect to fixed operating and financial cost. It measures the effect of change in sales on the level of earning per share. Why is Total Leverage the ultimate measurement that an entrepreneur would follow?